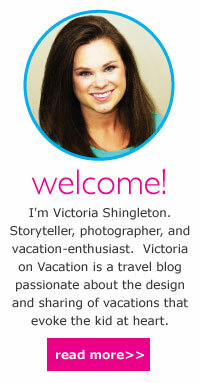 Welcome to my 2014 Spring Break Cruise trip report! I feel the need to start every cruise review with a little ‘disclaimer.’ This review will be told in a journalistic style with lots of photos. With the exception of this first post, I don't expect there to be too many posts with only paragraphs and paragraphs of text – I rely greatly on photos to tell the story. I also don’t take myself too seriously, and you shouldn't either. There will be a lot of fun-poking and maybe a little sarcasm, and you’re all invited to join in on the fun! I encourage you to post comments to share your thoughts and experiences, or just tell me who you are! My boyfriend, Max, is a civil engineering major at Clemson University, and you might recognize him from my Norwegian Epic Western Mediterranean review on Cruise Critic. This was his second cruise and his first Caribbean cruise. Max finds joy in the simplest things in life and is eager to share his enthusiasm with others. That being said, he's very fun to travel with because has an opinion about the smallest of details and is really good at pinpointing exactly what he likes and what he wishes was different. I think his observations will add a lot of value to this cruise review! If you're wondering about my sister, Rachel, don't worry! She went on a cruise of her own with her friend and my mother on the Norwegian Dawn and had a fabulous time. You'll see more of her (and Max) on our Disney Fantasy cruise in May! I had many different ideas of what I wanted to do for my final spring break. My first thought was Vegas because Max has really expressed an interest in going and accommodations are so affordable. However, after a bit of research and calculations (not to mention experience from previous trips), I realized that a week in Vegas was going to cost us much more in entertainment, and we weren't going to Vegas to sit by the pool all day. By the time I added in airfare and cabs, it was really starting to push our budget. And then I went home one afternoon because I needed the box to return a camera lens I had rented. 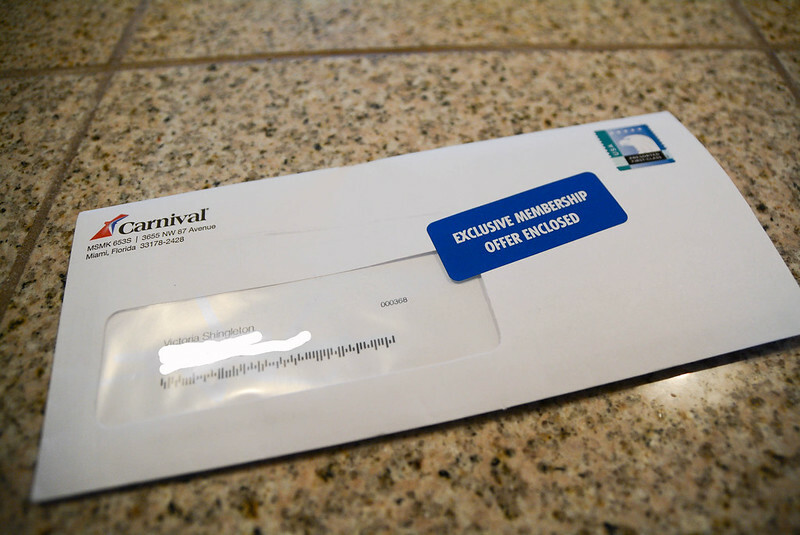 I was standing in the kitchen talking to my mother and mindlessly flipping through the mail when I noticed an envelope addressed to me from Carnival Cruise Line. 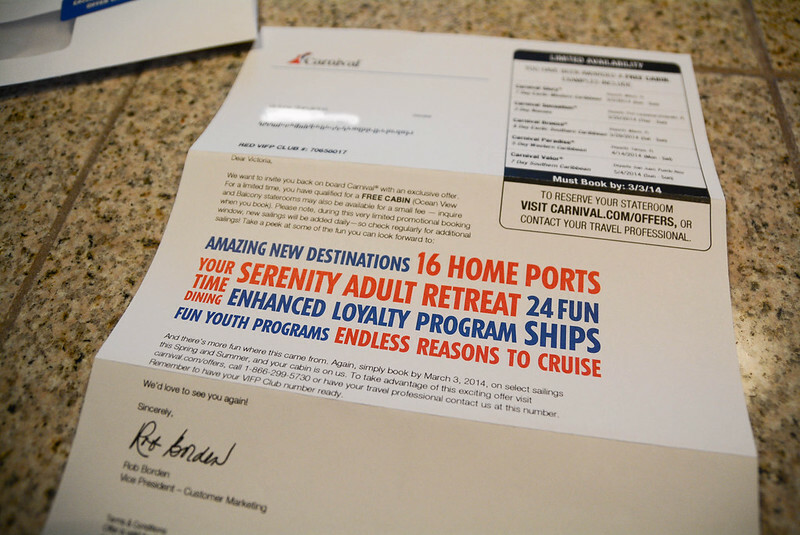 I knew exactly which cruise I wanted - the 8-day on the Carnival Breeze - and was excited to find that the March 15 sailing was included in the promotion. I immediately called Max and told him the good news. He was ecstatic and ready to book as long as my dad was good with the terms of agreement. Unfortunately, by the time my dad was home and able to check it out, the $80pp balcony room upgrade was gone. I contemplated briefly switching to the Carnival Dream (I've already been on that ship) so that I could get the balcony room but decided that was a ridiculous reason to pass up an extra day on a new ship with new ports. I called Carnival to book the cruise just to make sure that I understood everything (and was hoping that maybe there was a balcony available... no luck). 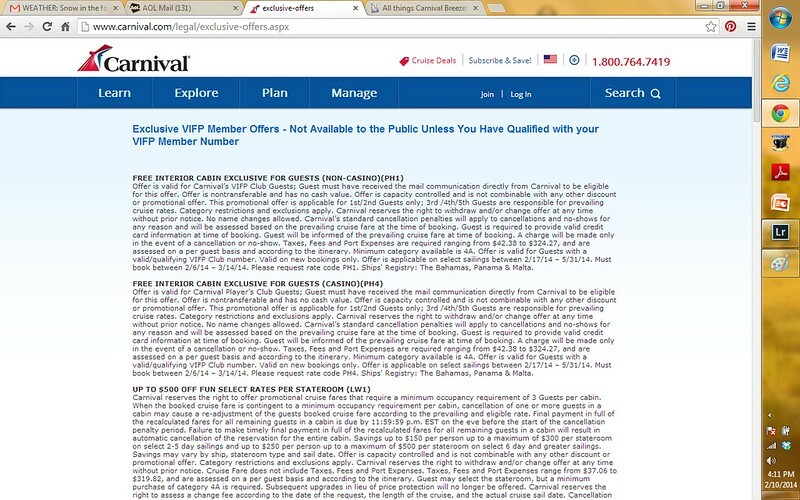 The Carnival representative was super excited for me, saying, "Who gives away free cruises? My company! It is a great company!" It's not actually a free cruise, just a free stateroom. We still paid taxes and government fees and also purchased the vacation protection. 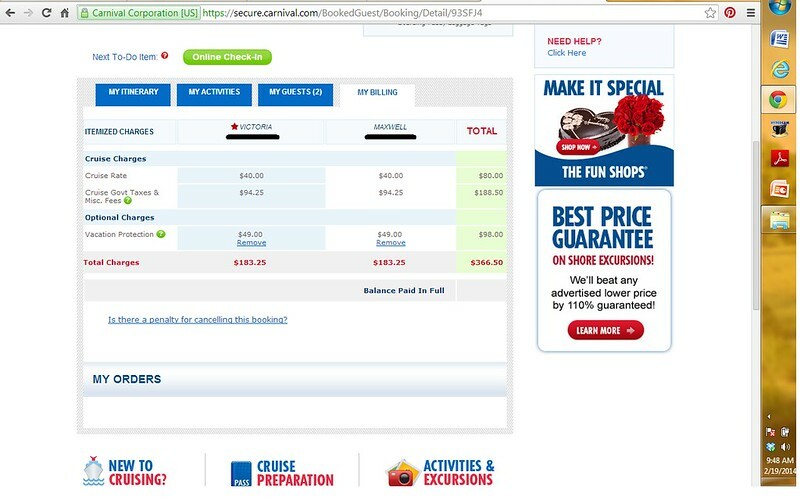 Which meant that the total cost of our cruise booking was only $366.50 for two people - still amazing! Well, I didn't get much of a choice. I wanted the $80pp balcony upgrade, but it was unavailable. So instead, I did the $40pp ocean view upgrade. The Carnival rep said that she had stayed in that category stateroom - she called it a family ocean view - and that it was a really great room and had two bathrooms. I had the choice between two rooms, and I chose the one closer to the stairs. This is something I completely skipped over for my Royal Princess review, but Max very much enjoys pre-cruise planning. 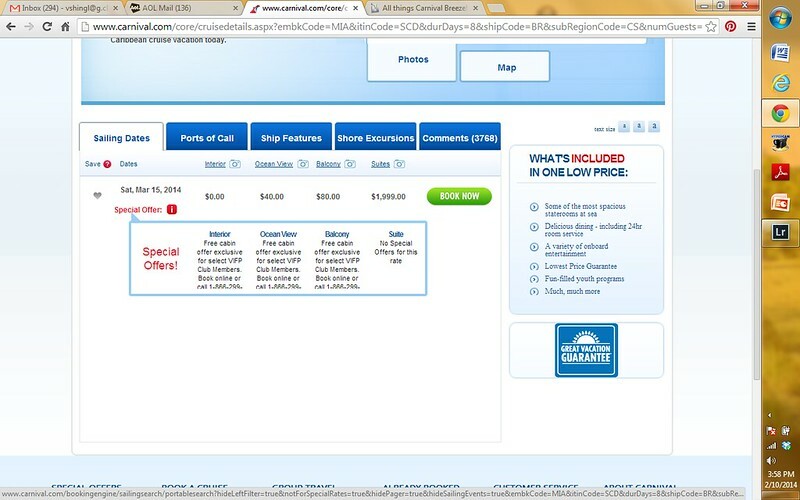 He enjoys looking through the excursions on the website and reading the reviews to decide what to do. The two of us got our SCUBA certifications this semester. Max's dad dives and had always encouraged Max to do it, and I finally had a bit of freedom in my schedule this semester, so we were able to do it through Clemson. We were looking to do a dive excursion, and there were three ports that offered it - Grand Turk, Aruba, and La Romana. After reading through the reviews, we decided that we couldn't pass up the opportunity to see the third largest barrier reef in the world and booked our scuba excursion for our day in Grand Turk through Carnival. The other excursion we booked was something I never would have even been interested in. But Max read the reviews which were very positive and decided that we should do the Dune Buggy tour in La Romana, Dominican Republic. It took a bit of persuasion to sell me on it, but the reviews on Carnival's website were very thorough, and this was something that I normally wouldn't do on a cruise with my family. 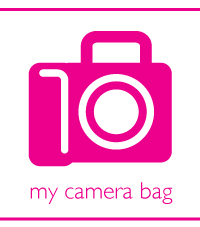 I usually get several questions about cameras and gear, so below I've listed all of the gear in my camera bag! It seems to grow larger with each review... I may be a bit of a gear addict. For the most part, I shoot with my Nikon D7100 which I carry around my neck almost all of the time. When I'm doing something risky or can't carry as much equipment, I shoot with my Nikon 1 compact camera. And for this trip, I rented a GoPro from BorrowLenses because I wanted to be able to take photos scuba diving, and I wanted to see if it was something I'd like to buy in the future. Also, I rented a GoPro Hero 3 Black Edition which came with the underwater housing and several other gadgets. I bought a GoPole mount from Amazon to use underwater.